Airbus today revealed the A220 at a ceremony held at its Henri-Ziegler Delivery Centre, near Toulouse, France. 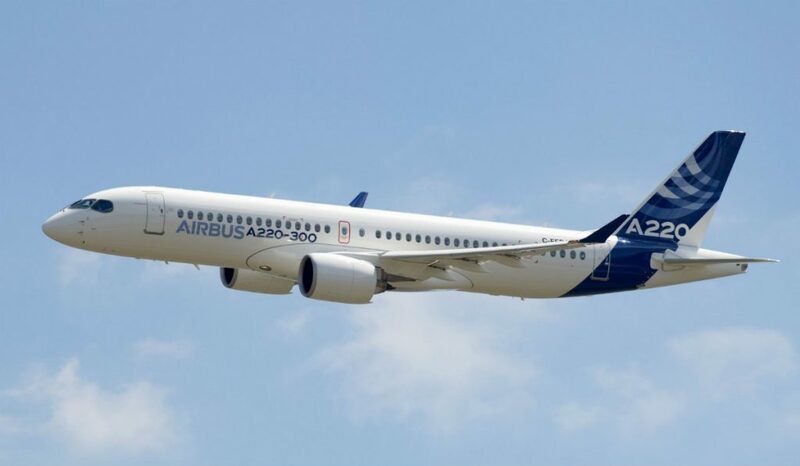 The A220 effectively replaces Bombardier’s C Series aircraft following the July 1, 2018, closing of a joint venture between the two companies, in which Airbus gained a major interest in the existing C Series Aircraft Limited Partnership. At 12:25 am CEST, in front of Airbus employees and members of the global news media, a new A220-300 landed directly from painting wearing its new Airbus name and colours. The A220 family comprises two models, the A220-100 and A220-300, formerly Bombardier’s CS100 and CS300. The aircraft are built for the 100- to 150-seat market. Expecting the A220 single-aisle family to capture a large percentage of the estimated 6,000 aircraft needed in this 100- to 150-seat segment over the next 20 years, Airbus explains this commercial addition complements its existing A320neo family.